Earth Friendly Tea Tree Oil Shower Kleener is pleasantly scented with a hint of lavender. Based on GM-free plant ingredients, this eco-friendly shower cleaner combines effective natural cleaning power with the fresh, natural fragrances. Also vegan and PETA approved (People for the Ethical treatment of Animals), the Earth Friendly shower cleaner is so easy to use and helps eliminate and prevent hard water stain and soap scum marks. Highly concentrated too, a little goes a long way so you get great value. For optimum results it is best to start with a clean surface. We recommend that before the first application of Shower Cleaner you clean tiles and glass with Orange Mate ready-to-use or Window Cleaner.For daily use in preventing soap scum build up, shake well and turn nozzle to spray setting and spray a fine mist over the tiles, glass and fittings of the cubicle and leave. Before reusing the shower, rinse with water and take care not to slip. 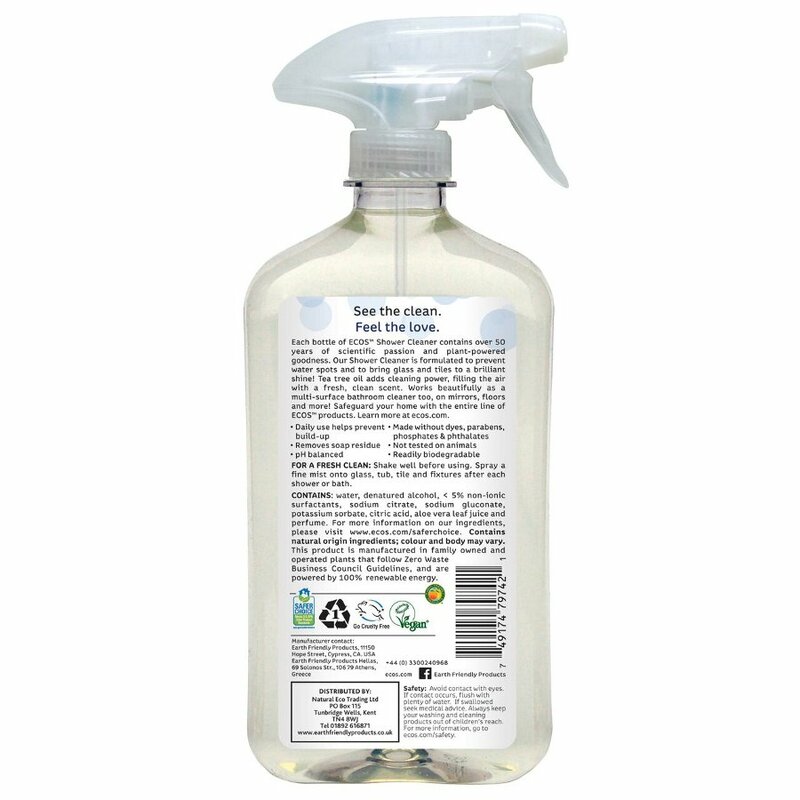 For use as a bathroom multi-surface cleaner, spray on to surface to be cleaned and wipe with damp cloth or towel. Leaves a pleasant lavender fragrance. 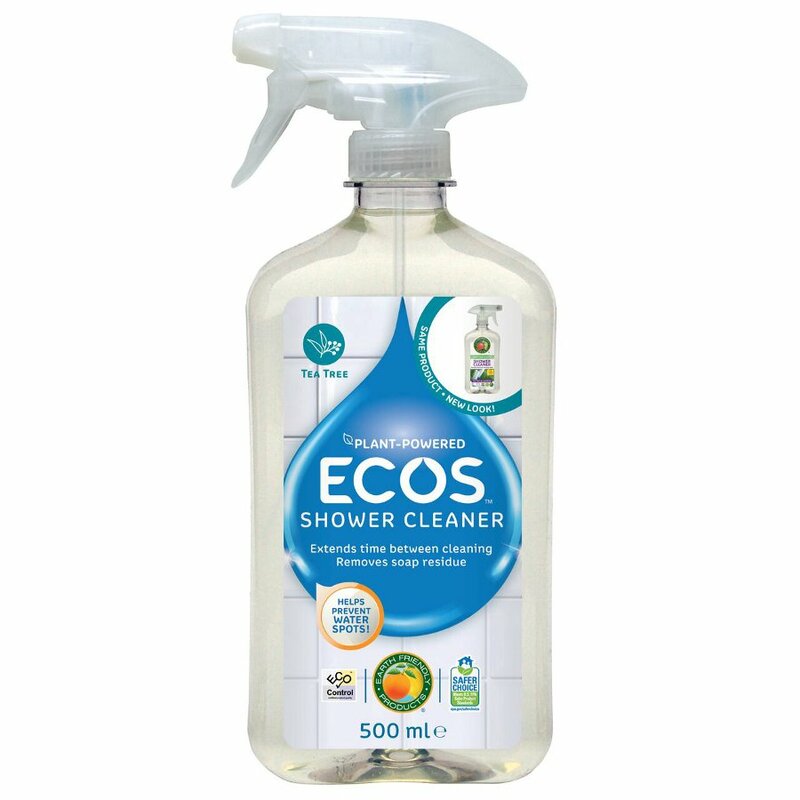 The ECOS Tea Tree Oil Shower Cleaner - 500ml product ethics are indicated below. To learn more about these product ethics and to see related products, follow the links below. Seem to use a lot to cover the shower compared to other shower cleaners but works well. We use this product daily and it is effective in a hard water area. have used this for years very good product.